Yellow nutsedge (Cyperus esculentus) is the second most troublesome weed behind Palmer amaranth (Amaranthus palmerii) and third most common weed in North Carolina sweetpotato (Webster 2010) (Figure 1) behind Palmer amaranth and carpetweed (Mollugo verticillata). Yellow nutsedge is a perennial sedge with an upright growth habit. Sedges are often confused with grasses and rushes due to their similar appearance. However, sedges are easily distinguished from grasses because they have triangular stems rather than the round or oval stems of grasses or rushes (DeFelice 2002) (Figure 2). Plants in the sedge family can be easily identified as sedges by cutting across the stem with a knife and observing whether the stem is triangular. Yellow nutsedge also can easily be confused with another common sedge species—purple nutsedge. Several key features can help you easily distinguish between yellow and purple nutsedge. The first is the leaf blade; the yellow nutsedge leaf blade tapers to a long, sharp point, whereas purple nutsedge has a more blunt leaf tip (Figure 3). Another key feature is how the tubers grow and the way they are attached to the mother plant. In yellow nutsedge, the tubers grow and are directly attached to the mother plant. Purple nutsedge, however, has tubers that grow in a chain-like fashion away from the mother plant. A final difference is the flower heads, which are yellow in yellow nutsedge and purplish red in purple nutsedge (Bryson and DeFelice 2009) (Figure 4). There are also species of annual sedges that emerge from seed each year, sometimes confusing identification of yellow nutsedge. Many of these species grow in dense mats, some smaller than or as large as yellow nutsedge. Some of these species are common to crop fields and others are not. Figure 1. Yellow nutsedge in sweetpotato. Figure 2. Stem cross section of a sedge. Figure 3. Leaf blade comparison between yellow and purple nutsedge. Figure 4. Yellow versus purple nutsedge flower head. Yellow nutsedge can grow and survive in almost any climate but prefers warm, moist areas (DeFelice 2002). 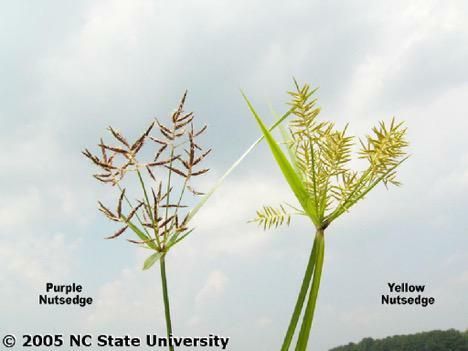 This environmental preference helps explain why yellow nutsedge is such a problem across the southeastern United States. Yellow nutsedge reproduces and spreads by producing rhizomes and tubers. These tubers can survive in the soil for three to five years and germinate from several inches deep. The number of tubers in the soil can rapidly increase; a single tuber can produce more than 360 tubers in 16 weeks during the growing season (Webster 2005a). Yellow nutsedge spreads rapidly within a field. If left undisturbed, it will grow in patches that will enlarge at approximately 1 square yard per year (Webster 2005b). Cultivation can rapidly spread yellow nutsedge tubers and rhizomes across fields and establish new patches. Tubers can also be transported between fields on cultivation equipment. To prevent the spread of yellow nutsedge to new fields, it is best to cultivate fields infested with yellow nutsedge last and then thoroughly clean the cultivation equipment before leaving the field (Webster 2005b; Meyers and Shankle 2016). One option for cleaning cultivation equipment is to power wash it in a noncrop area. Yellow nutsedge competes with sweetpotato for water, nutrients, light, and space. This competition often leads to reduced yield and quality. 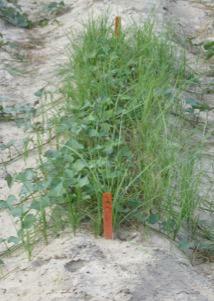 Yellow nutsedge can affect quality by causing small sweetpotatoes or by growing rhizomes through the storage roots (Figure 5). Yield loss from interference with yellow nutsedge depends on the density of the yellow nutsedge. Even with as few as 15 yellow nutsedge plants per square yard two weeks after sweetpotato transplanting, predicted marketable yield loss is as much as 35 percent less than weed-free sweetpotato. At densities of more than 60 yellow nutsedge per square yard two weeks after sweetpotato transplanting, marketable yield loss is greater than 60 percent (Meyers and Shankle 2015). Other research has shown a marketable yield loss of 623 pounds per acre for every week during the growing season that yellow nutsedge is allowed to compete with the crop (Beam 2016). Figure 5. Yellow nutsedge rhizome growing though a sweetpotato storage root. Control options for yellow nutsedge in sweetpotato are limited. The only registered herbicide for application in sweetpotato that has activity on yellow nutsedge is S-metolachlor (Dual Magnum). S-metolachlor only has preemergence activity on yellow nutsedge. If yellow nutsedge has emerged, S-metolachlor will not control this weed. S-metolachlor should be applied to weed-free sweetpotato 7 to 14 days after transplanting to reduce the risk of injury to the developing sweetpotato storage roots. 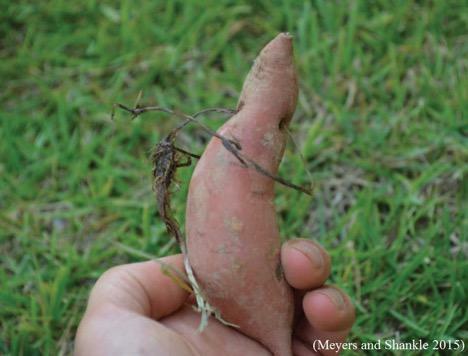 If S-metolachlor is applied to sweetpotato too soon after transplanting and heavy rains occur, injury, such as shortening and rounding of roots, can occur (Meyers et al. 2010; Meyers et al. 2013). Other methods to control yellow nutsedge in sweetpotato include cultivation and hand removal. Standard cultivation equipment can be effective at removing yellow nutsedge between rows if cultivation is timely (J.R. Schultheis, personal communication). Yellow nutsedge is quick to set tubers, so to effectively control yellow nutsedge with cultivation, do so soon after emergence so that the plants are killed and not allowed to develop tubers to be redistributed across a field during the cultivation process (Webster 2005a; Meyers and Shankle 2016). To remove in-row yellow nutsedge, you would need specialized cultivation equipment. Several companies manufacture plastic-lined finger cultivators for in-row cultivation of sweetpotato and other vegetable crops. Jonathan Schultheis, NC State University Extension specialist for sweetpotato, stated that cultivation can only be performed until the canopy starts to close, approximately 30 to 35 days after transplanting (personal conversation March 2, 2016). Hand removal of yellow nutsedge is possible but is very expensive ($200 to $400 per acre) compared to other weed control methods (Ted Burch, grower, personal communication in a telephone conversation January 23, 2018). When hand removing yellow nutsedge, both the stem and root system must be removed. Yellow nutsedge is prone to snap off at the soil line and can regrow. Beam, S. C. Influence of Herbicides on the Development of Internal Necrosis of Sweetpotato and Herbicide Tolerance of Sweetpotato. Master’s thesis. Raleigh, NC: North Carolina State University, 2016. 88 p.
Bryson, C. T., M. S. DeFelice eds. 2009. Weeds of the South. Athens, GA: University of Georgia Press. 468 p.
DeFelice, M. S. 2002. Yellow Nutsedge Cyperus esculentus—Snack Food of the Gods. Weed Technol 16:901-907. Flessner, M. L. 2016. 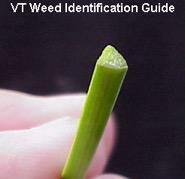 Virginia Tech Weed Identification Guide. Virginia Polytechnic Institute and State University: Department of Plant Pathology, Physiology, and Weed Science. Meyers, S. L., K. M. Jennings, J. R. Schultheis, D. W. Monks. 2010. Evaluation of Flumioxazin and S-metolachlor Rate and Timing for Palmer Amaranth (Amaranthus palmeri) Control in Sweetpotato. Weed Technol 24:495-503. Meyers, S. L, M. W Shankle. 2015. Interference of Yellow Nutsedge (Cyperus esculentus) in ‘Beauregard’ Sweet Potato (Ipomoea batatas). Weed Technol 29:854-860. Meyers, S. L, M. W. Shankle. 2016. Postemergence Yellow Nutsedge Management in Sweetpotato. Weed Technol 30:148-153. Meyers, S. L., K. M Jennings, D. W. Monks, D. K. Miller, M. W. Shankle. 2013. Rate and Application Timing Effects on Tolerance of Covington Sweetpotato to S-metolachlor. Weed Technol 27:729-734. North Carolina State University. 2016. TurfFiles: Center for Turfgrass Environmental Research & Education. North Carolina State University. Webster, T. M. 2005a. Mulch Type Affects Growth and Tuber Production of Yellow Nutsedge (Cyperus esculentus) and Purple Nutsedge (Cyperus rotundus). Weed Sci 53:834-838. Webster, T. M. 2005b. Patch Expansion of Purple Nutsedge (Cyperus rotundus) and Yellow Nutsedge (Cyperus esculentus) With and Without Polyethylene Mulch. Weed Sci 53:839-845. Webster, T. M. 2010. Weed Survey—Southern States. Vegetable, Fruit, and Nut Crops Subsection. Proc South Weed Sci Soc 63.